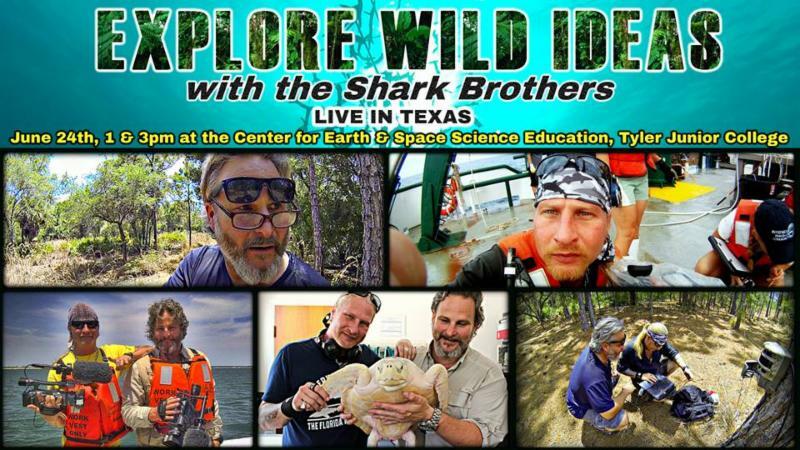 The Shark Brothers are coming to the TJC Science Center! We are pleased to announce that the Shark Brothers are coming to the TJC Science Center on Friday, June 23rd and Saturday, June 24th. Their interactive presentation called "Explore Wild Ideas" will be presented at 1:00 pm and 3:00 pm on Friday and Saturday. Sean and Brooks Paxton's fascination with sharks took hold during childhood, after seeing the movie "Jaws" in 1975. Since the early 2000s, as the Shark Brothers, they have become known as innovators and shark experts, taking an active role in shark management and conservation efforts through their experience as explorers, divers, anglers, performers and producers. They are now widely recognized as influential personalities in the world of educational entertainment with regard to a number of topics including sharks. They maintain a heavy schedule driven by a host of projects highlighting a number of outdoor adventure, exploration and wildlife topics resulting in work seen internationally on the Discovery Channel, Shark Week, PBS, National Geographic, the Weather Channel, FOX and NBC. "Their new interactive multimedia presentation will engage the audience and teach them all about their line of work, plus they will have some exclusive footage to show," said Brian Kremer, TJC science center coordinator. "It will be a very exciting, informative show."